One of the very first 308 GTBs built, this chassis was converted to Group 4 specification by Carlo Facetti in time for the 1978 Daytona 24 Hours. It was entered in the race by the Jolly Club and qualified just ahead of the sister car. Transmission issues brought an early end to the car's charge. 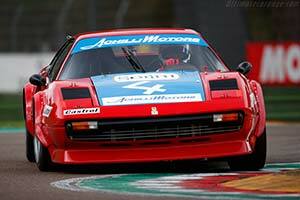 Back in Europe, it was then campaigned by Facetti himself in the Italian 1978 GT Championship. He would drive it to four victories on the way to the Group 4 title. Its last major race was in May of 1979, when Facetti crashed out of the Havirov International after staring second. It was restored to full running order and more recently has been meticulously been re-commissioned by Belgian specialists Gipimotor. It is currently liveried in the colours that it ran during the 1978 Daytona 24 Hours.